It’s time to take you on another culinary journey! It’s date night, and I’ve taken your weekly or monthly need for romance, good food, and glamorously seductive surroundings to a whole new level. Be prepared to be spoiled for choice. Nestled beneath the calming oasis that is Opposite House Hotel you will find a touch of unpretentious class. This one is for the discerning date night foodie, who will enjoy an eclectic mix of some of China’s best-loved and most inspired cuisines. In this former nightclub, now a mood-lit and modern dining space, friendly and knowledgeable staff await to help you peruse the concise but colorful menu. Let the well-traveled and experienced front-of-house team take care of you, with paired wines poured by their resident sommelier, and beautifully presented dishes that deliver on both elegance and flavor. Punchy, sweet cherry tomatoes in plum sauce (RMB 58) burst in the mouth to provide you with an appetizer that could just as well be a dessert or sweet palate cleanser. This dish was a surprising and robust element among the flawless, flavorsome bowls I devoured before the main; Sichuan poached chicken with crushed peanuts in spicy sauce (RMB 78), tea plant mushroom salad with Meiji dressing (RMB 78), and botan shrimp with ginger dressing (RMB 118). Simply divine. Don’t let the starched linen covered tabletops deceive you. No one is trading in substance for style. 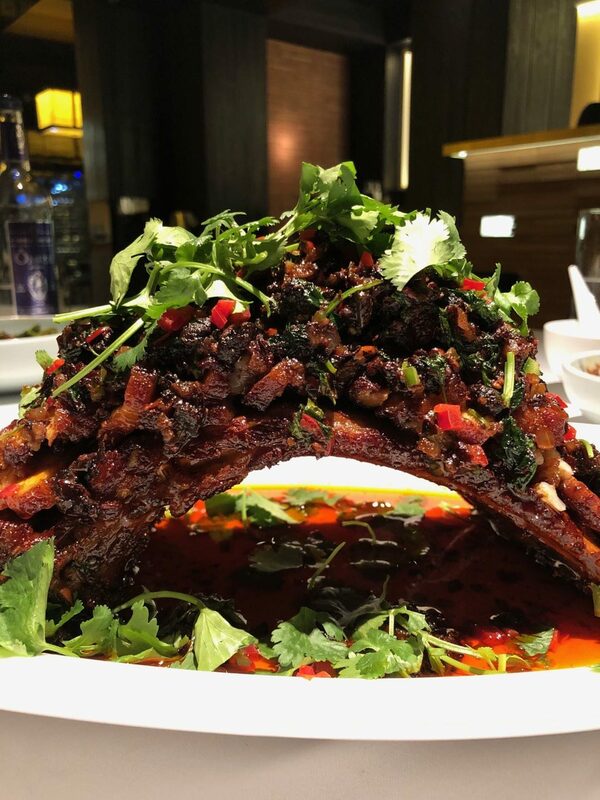 This is fine dining with a hedonistic and modern flair epitomized by such dishes as the Jing Yaa Tang pork ribs in spicy black bean sauce (RMB 198). Guests can also enjoy well-executed classic offerings like stir-fried string beans with minced pork (RMB 68). Whatever you do, don’t leave without ordering the “three cups” clay pot with cod fish and basil (RMB 228). A little more on the pricey side, but worth the extra Renminbi for an experience I can only describe as heavenly. 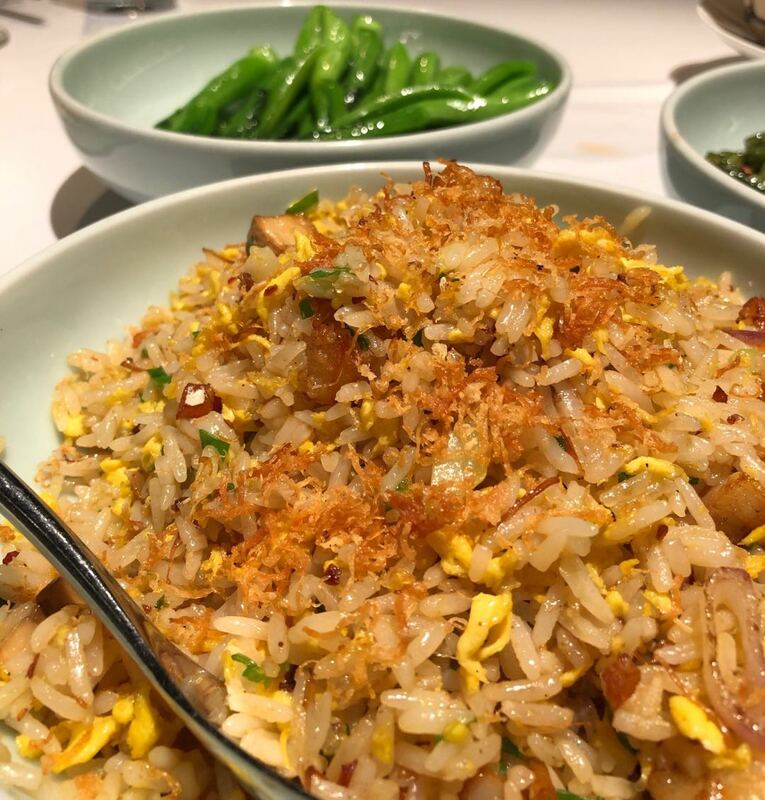 If you’ve frequented just a few Chinese restaurants in the Jing, you will know that most will offer some variation of Chinese fried rice (chǎo fàn), and here you will find what I believe to be a superior take on the humble staple. Shaved dried scallop, organic egg, and beautifully cooked shrimp dress white grains of seasoned rice in their Jing Yaa Tang fried rice (RMB 128). A cut above all the rest. All this, washed down with a Sauvignon Blanc (RMB 85 per glass) to pair the starters, and a Pinot Noir (RMB 120 per glass) for the pièce de résistance that was the Jing Yaa Tang Roast Duck (RMB 188, half/ RMB 328, whole). 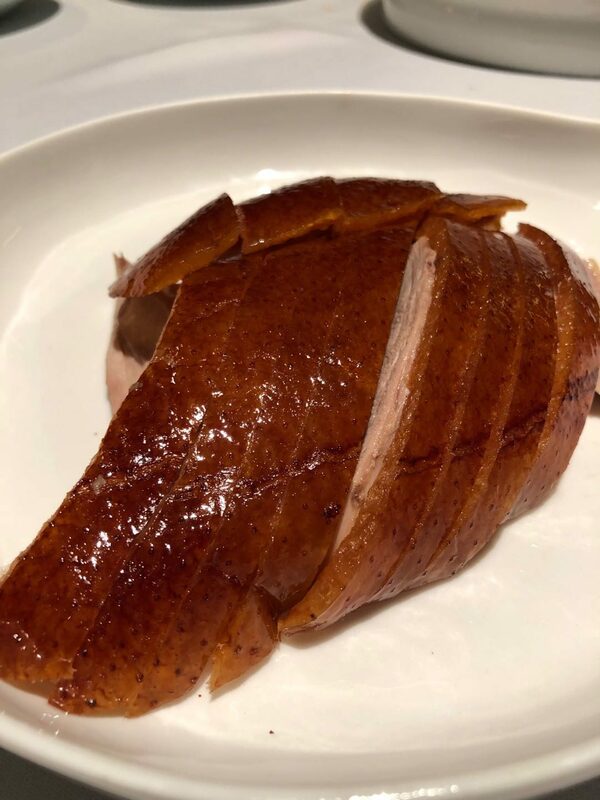 Hung and dried in-house for 24 hours before cooking, the duck really is a showstopper, not because of the usual ceremonial carving at the table, but because of the quality of the duck served, with exceptionally crispy skin that melts in the mouth. If you really want to impress on date night, this is the way to go. The simple equation that leads to all successful date nights is atmospheric surroundings, plus good food. 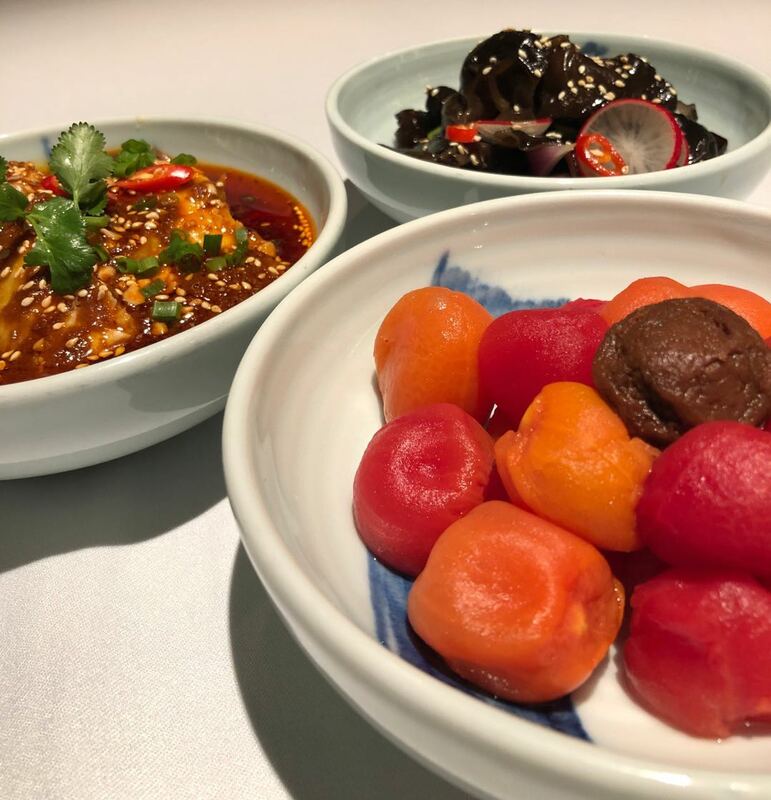 Jing Yaa Tang has perfectly partnered these two elements and takes you on a refined culinary expedition of China’s expansive regional delicacies. Top tip: Before taking to your seats, take a look at the installations on loan in the exhibition hall in the lobby area of the hotel, and grab a cocktail at Mesh. The Jing Yaa Tang (RMB 88) is fab: a sweet take on the classic whiskey sour with notes of orange in the finish. Enjoy!